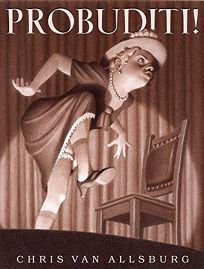 The magic in Van Allsburg's new book Probuditi! has been domesticated. Instead of supernatural powers sending rhinos charging through the living room, as in Jumanji , or spacemen falling through the ceiling, as in Zathura , Calvin, the protagonist of Probuditi! , employs a simple magician's trick to set the story in motion. Calvin and his buddy Rodney attend a performance by Lomax the Magnificent where the magician, by means of a rotating spiral disc, hypnotizes a woman and convinces her that she is a chicken. At the end of the show, Lomax says, "Probuditi!" and the woman snaps out of her trance. Inspired, Calvin makes his own rotating disc and manages to hypnotize his sister, Trudy, into thinking that she's a dog. Calvin and Rodney thoroughly enjoy Trudy's canine antics until they realize that Calvin's mom will soon be home, and they can't remember the magic word to reverse the spell. After several frantic dehypnotizing tries, it all works out with a little quiet help from Trudy. Although I miss the sense of otherworldly beauty that Van Allsburg achieved in some of his earlier books, particularly The Wreck of the Zephyr , the vaudevillian spirit of Probuditi! gives the artist a chance to make some very funny pictures. The lady Lomax hypnotizes struts around an imaginary barnyard like a crazed hen who happens to be wearing pearls and high heels. Trudy laps water from a bowl on the floor with almost embarrassing relish, and squats expectantly like a goofy golden retriever. All the characters and the scenes they inhabit seem to come from some iconic 1940s smalltown childhood, which is made all the more nostalgic by the artist wrapping them in a haze of luminosity. This typical "Van Allsburg light" is so effective in the way that it leavens the painstaking solidity of his illustrations and connects the details in a convincing atmosphere. So even though he is not using his light to bathe the classic simplicity of a sailboat floating through the sky, the light in these pictures still works to create the glow that we have come to expect in a Van Allsburg book and to give this homespun tale the quality of a remembered dream. Jim McMullan, known for his Lincoln Center Theater posters, has most recently illustrated the picture book I'm Dirty! (HarperCollins/Cotler, Sept.), written by his wife, Kate McMullan, and starring a backhoe loader.